Recently, I connected two dear friends of mine Kei Meguro and Dena Cooper - both incredible forces of creative nature in their own right. During the excitement of getting to know each other, Kei put forward the suggestion to work together as a group and create a special artwork for IWD 2018, Dena and I obviously both jumped at the opportunity. With two weeks to go and two different time zones, it was a race against the clock BUT we managed to make it and have fun with all timezone and timeline obstacles we faced. As a result, Black Orchid was created. 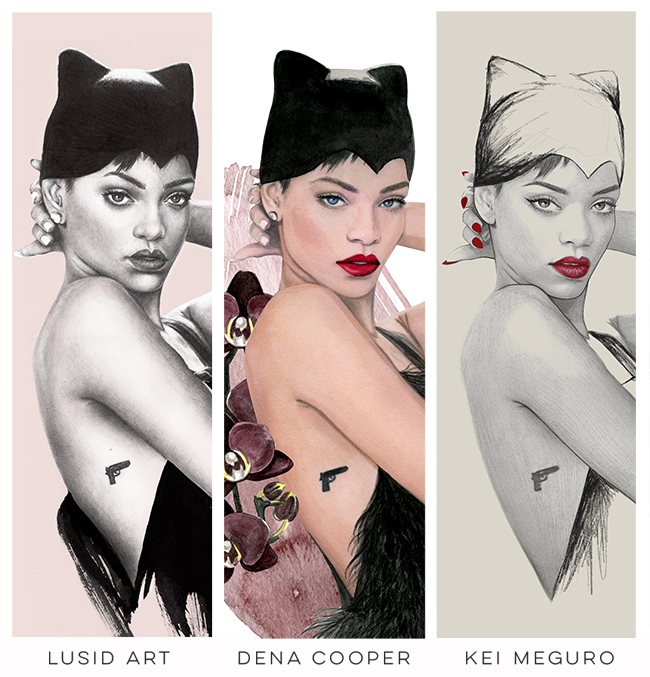 Inspired by Rihanna, for her philanthropic efforts and humility, Black Orchid was made up by each of us creating our own artworks of the same image with the end goal to bring the three together, creating an entirely new style. With what we saw as a great success, Black Orchid for the three of us is a celebration of what is possible when women empower women and break down the barriers and conditioning of competition and comparison we have known for so long as females. I couldn’t be more grateful to have worked on such a fun and special collaboration with two incredibly talented and supportive women such as Kei and Dena. I also thought this would be the perfect opportunity to start a conversation about what we have learnt and experienced in our own personal journeys with a little Q&A. Did you have any personal challenges within this collaboration? A: Although Kei and I have different styles, we both focus on similar things, so for me, it was a matter of finding a happy medium with our artworks and letting go of control and trusting the process with the end result in mind. D: I’m the kind of person that over-plans and sometimes I lose the magic of creative flow because I’m a bit too tightly wound. During the collab I consciously shut that fear off because I was so excited about what the project could be. I was definitely full of anxiety about what could go wrong but in the end was so pleasantly surprised by how it all came together. Working with two creatives that I have immense trust and admiration for helped me overcome my fears and get excited about the unknown. What advice would you give to someone feeling the squeeze of competition and comparison? A: I think we’ve all felt the comparison and even competition squeeze at some point, and I think there’s power in acknowledging it and dealing with it - For me, it really helped by talking to friends and also stepping back and looking at my style and my goals collectively and working on focusing on myself. It can take time, so have self-compassion. D: This is such a huge issue for a lot of creatives. I’ve never had that overwhelming feeling of jealousy or envy about someone else’s work. Instead I try to study what makes their work so successful and try to nurture those qualities in my own work. I think being connected with other artists can do so much to strengthen your skills if you have a positive attitude and let go of comparison and competition. We should be celebrating what makes each of us unique and uplifting each other for our successes instead of tearing each other down in comparison. K: At the end of the day, it's a competition with yourself. Find that one thing you thrive, shine and love to do, keep on doing 'you' and evolve. What message do you want Black Orchid to have when people discover this artwork? A: That there is enough room for everyone and that feeling grows as you embrace it. Trust and celebrate those around you doing amazing things. D: A personal gripe I have about the feminist movement is that with all the “femme swag” out there it’s so easy to brand yourself as a feminist and feel like you’ve accomplished something. We shouldn’t be satisfied with what essentially boils down to inaction. Getting your hands dirty with volunteer work, donating to the cause, or making a profound statement that gets people thinking are all better ways to contribute to the movement. In my mind Black Orchid embodies a take action approach. We’ve found a way to use our artwork to raise funds for the cause, all the while supporting and promoting each other as female artists. K: I hope Black Orchid shows the harmony of three creatives who raise and lift each other. Some may think it's hard for women to work in groups, but it's entirely possible as long as you have utter respect and love for each other.